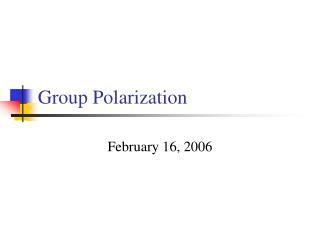 Group Polarization. September 14, 2006. Adding the Element of Interaction. 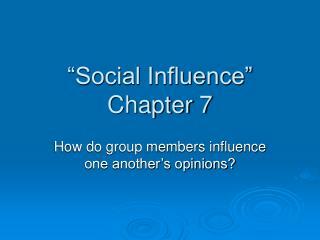 Groups interact with one another to make judgments and decisions. E.g. Juries, Top Management Teams, Presidential Cabinets. 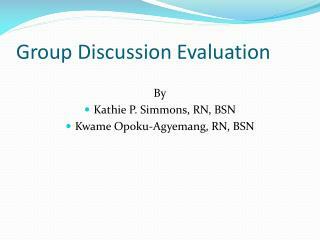 Key Questions: How judgments made by individuals compare to judgments made by a group? 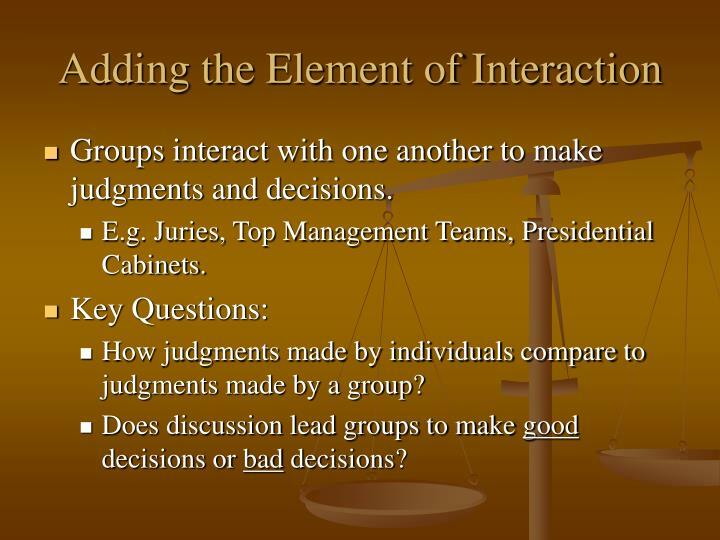 Groups interact with one another to make judgments and decisions. E.g. Juries, Top Management Teams, Presidential Cabinets. How judgments made by individuals compare to judgments made by a group? 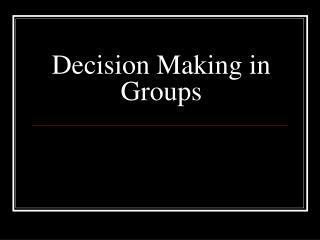 Does discussion lead groups to make good decisions or bad decisions? 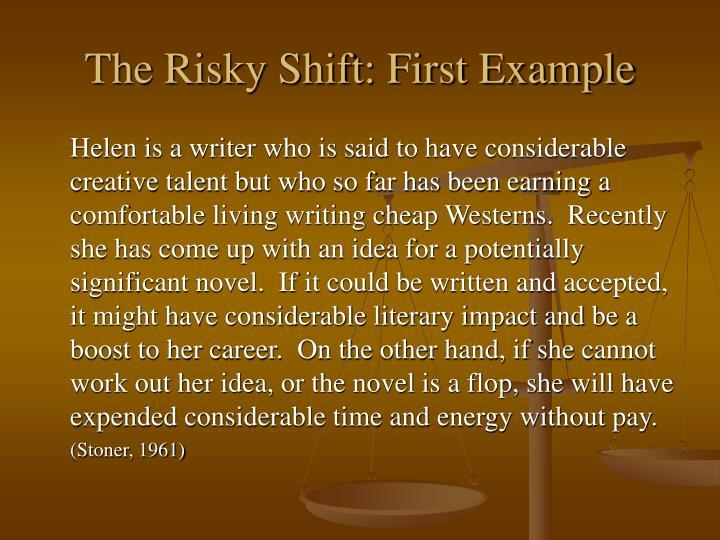 Helen is a writer who is said to have considerable creative talent but who so far has been earning a comfortable living writing cheap Westerns. Recently she has come up with an idea for a potentially significant novel. If it could be written and accepted, it might have considerable literary impact and be a boost to her career. On the other hand, if she cannot work out her idea, or the novel is a flop, she will have expended considerable time and energy without pay. 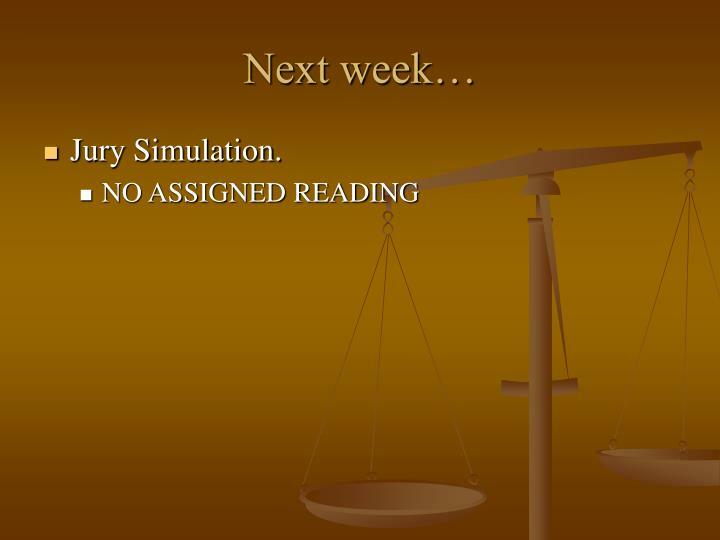 Decision: What Should Helen Do? Imagine that you are advising Helen. 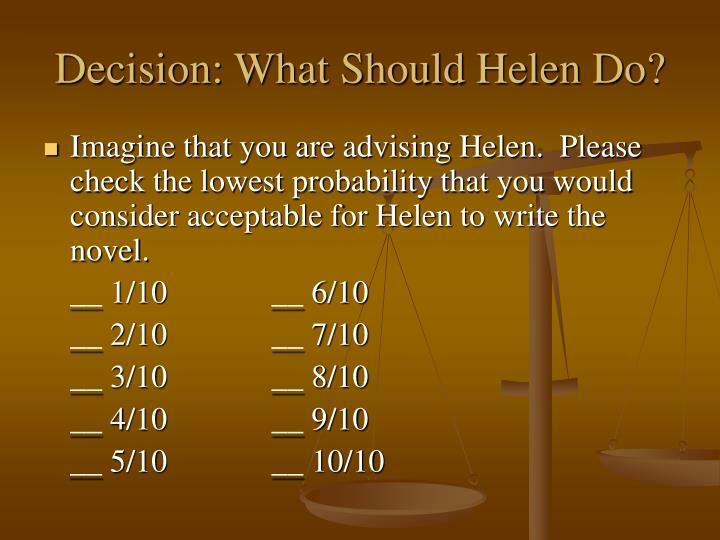 Please check the lowest probability that you would consider acceptable for Helen to write the novel. Individuals marked their answers first while alone, and then again after discussing their opinions with a group. 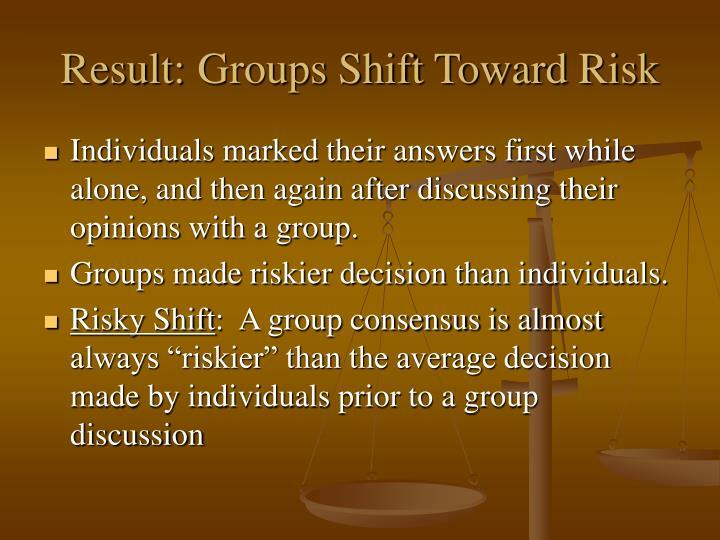 Groups made riskier decision than individuals. People asked to make bets first as individuals then as a group. 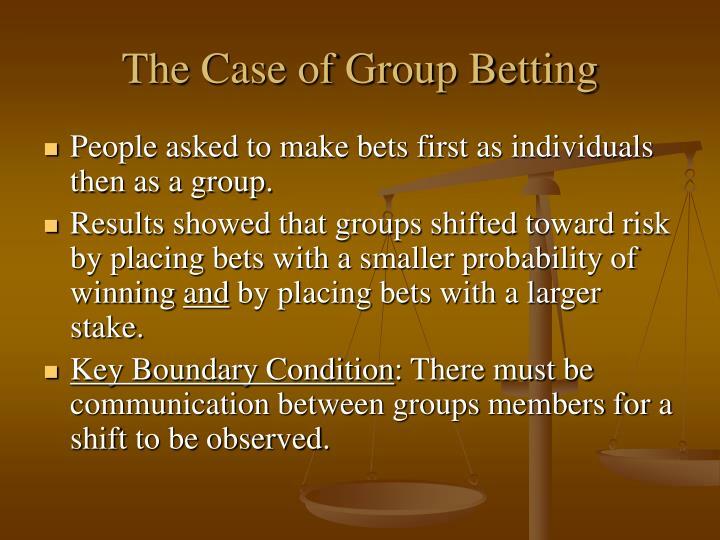 Results showed that groups shifted toward risk by placing bets with a smaller probability of winning and by placing bets with a larger stake. Key Boundary Condition: There must be communication between groups members for a shift to be observed. Why a Shift Toward Risk? 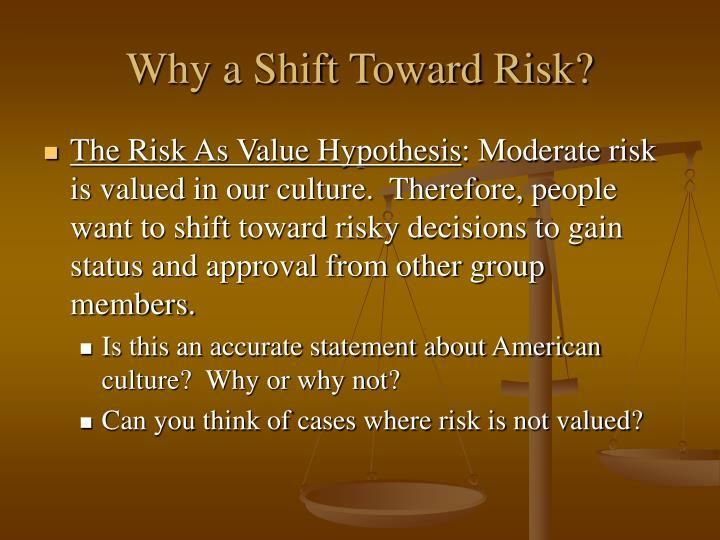 The Risk As Value Hypothesis: Moderate risk is valued in our culture. 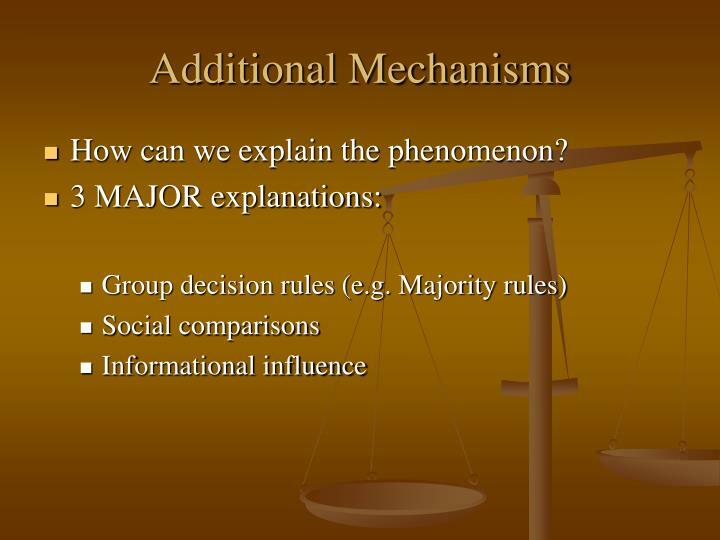 Therefore, people want to shift toward risky decisions to gain status and approval from other group members. Is this an accurate statement about American culture? Why or why not? Can you think of cases where risk is not valued? 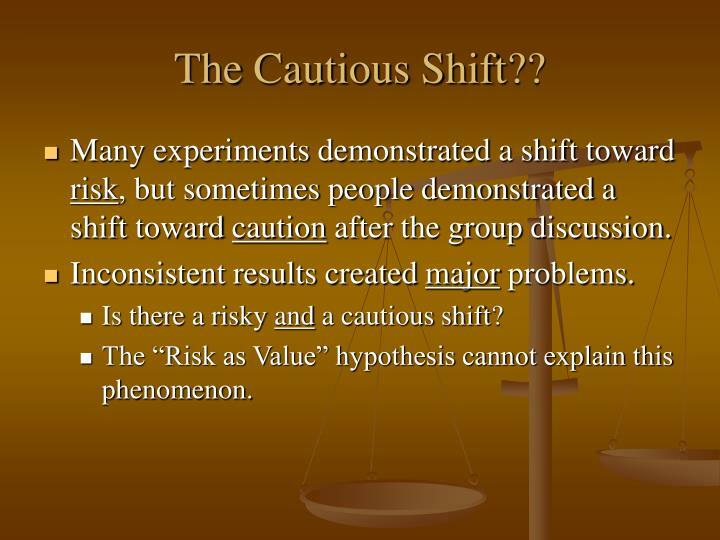 Many experiments demonstrated a shift toward risk, but sometimes people demonstrated a shift toward caution after the group discussion. Inconsistent results created major problems. Is there a risky and a cautious shift? The “Risk as Value” hypothesis cannot explain this phenomenon. 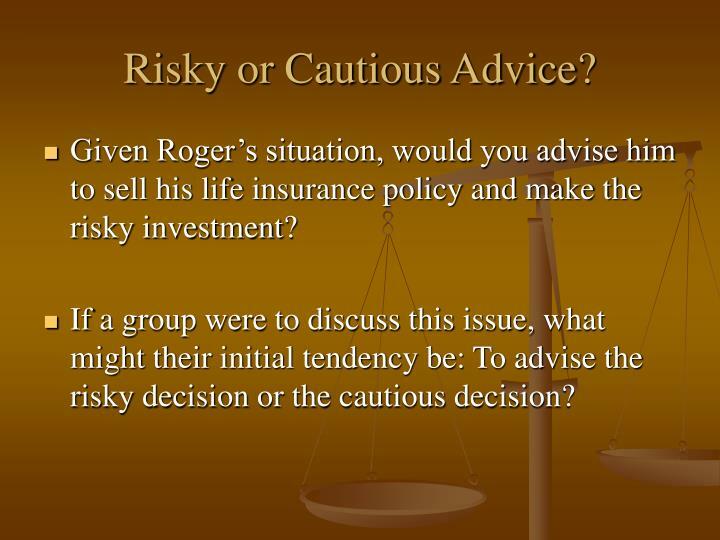 Given Roger’s situation, would you advise him to sell his life insurance policy and make the risky investment? 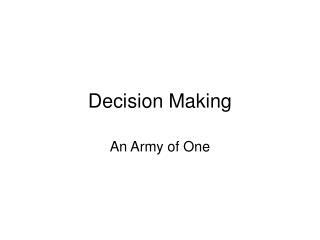 If a group were to discuss this issue, what might their initial tendency be: To advise the risky decision or the cautious decision? 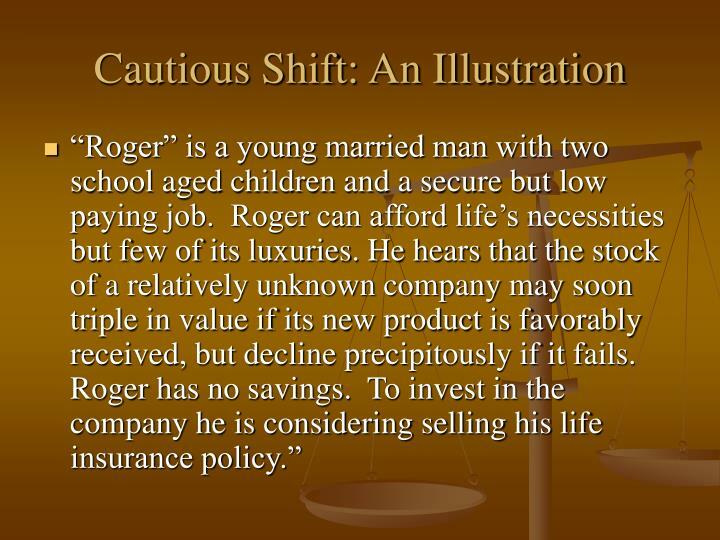 The “Risky Shift” is not about risk at all. 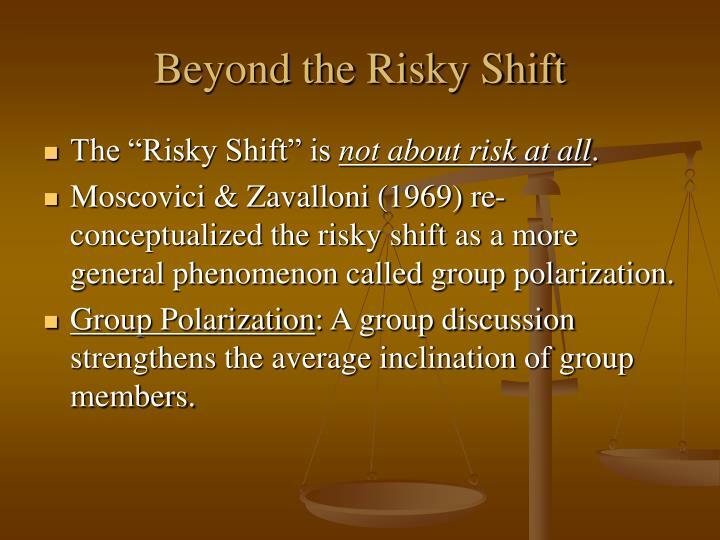 Moscovici & Zavalloni (1969) re-conceptualized the risky shift as a more general phenomenon called group polarization. 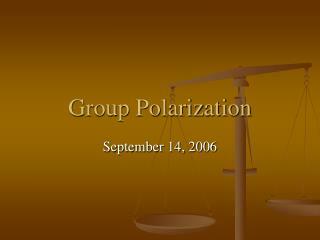 Group Polarization: A group discussion strengthens the average inclination of group members. 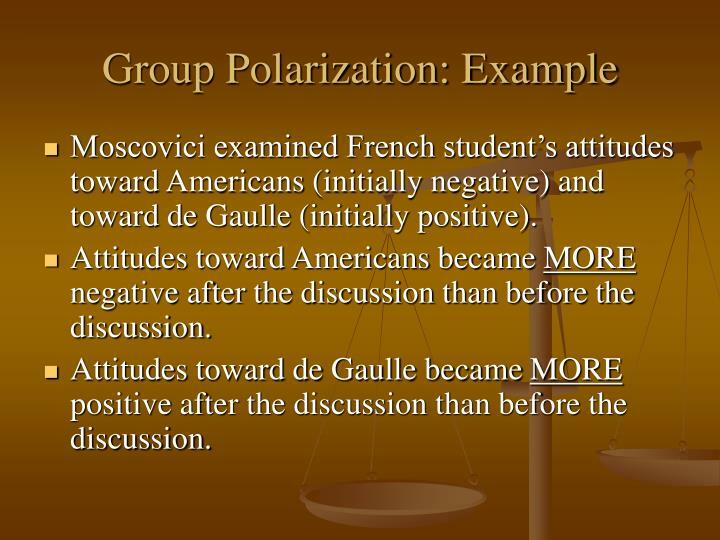 Moscovici examined French student’s attitudes toward Americans (initially negative) and toward de Gaulle (initially positive). 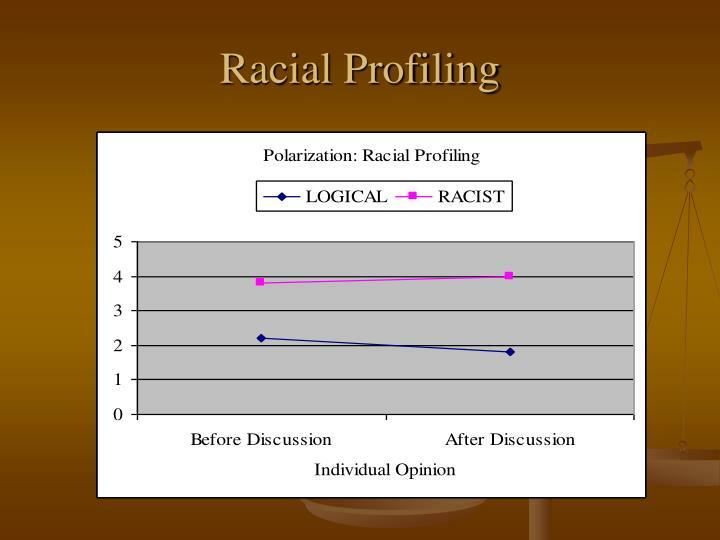 Attitudes toward Americans became MORE negative after the discussion than before the discussion. Attitudes toward de Gaulle became MORE positive after the discussion than before the discussion. Attitudes of students toward their school. Less dogmatic juries toward lenient sentences. 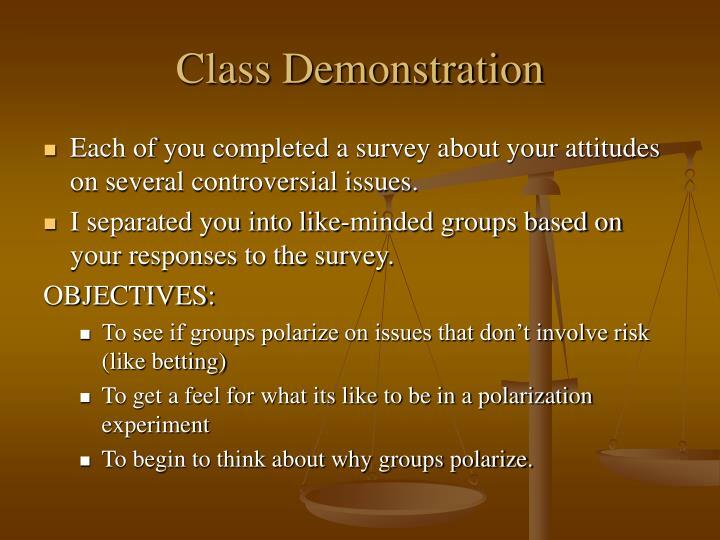 Each of you completed a survey about your attitudes on several controversial issues. 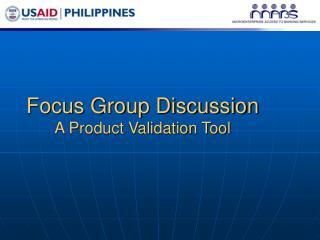 I separated you into like-minded groups based on your responses to the survey. 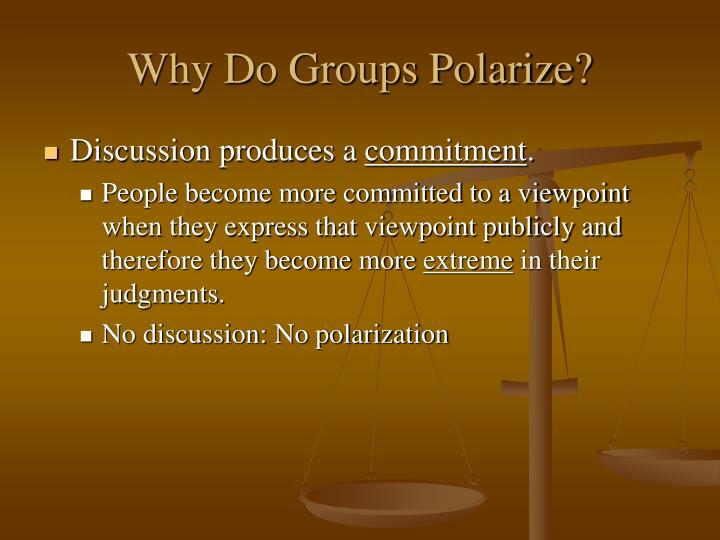 To begin to think about why groups polarize. People become more committed to a viewpoint when they express that viewpoint publicly and therefore they become more extreme in their judgments. How can we explain the phenomenon? 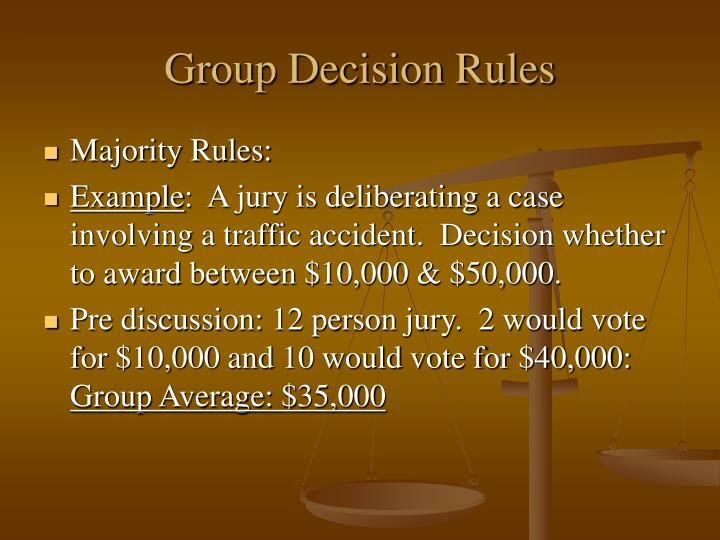 Example: A jury is deliberating a case involving a traffic accident. Decision whether to award between $10,000 & $50,000. People can actually change their post-discussion judgments (internalization). Caring for others, being adventurous, taking health risks, etc. 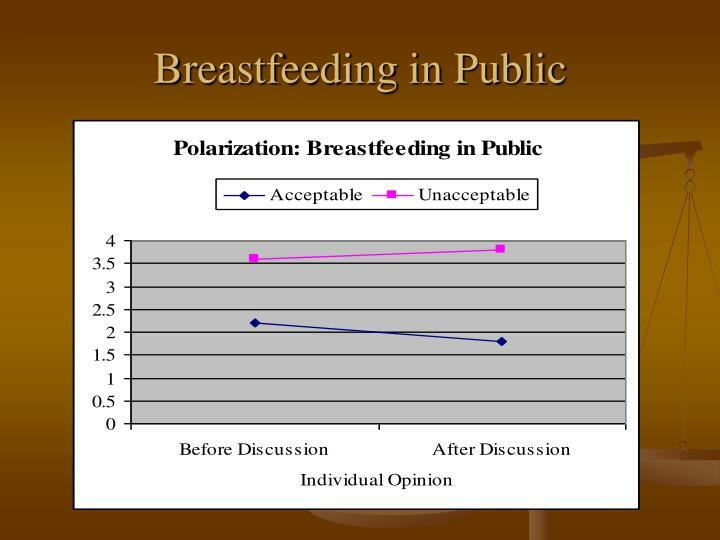 Prior to discussion most people believe they are farther toward the favorable pole than everyone else. 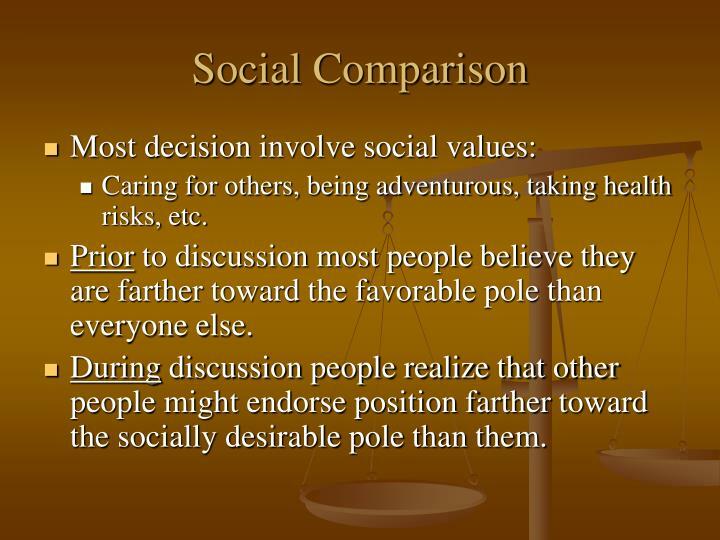 During discussion people realize that other people might endorse position farther toward the socially desirable pole than them. Result: People are motivated to move farther toward the socially desirable end of the scale. 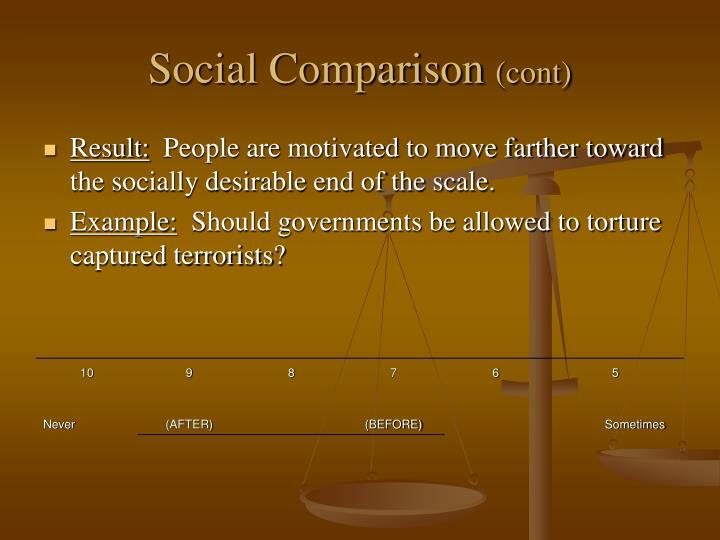 Example: Should governments be allowed to torture captured terrorists? 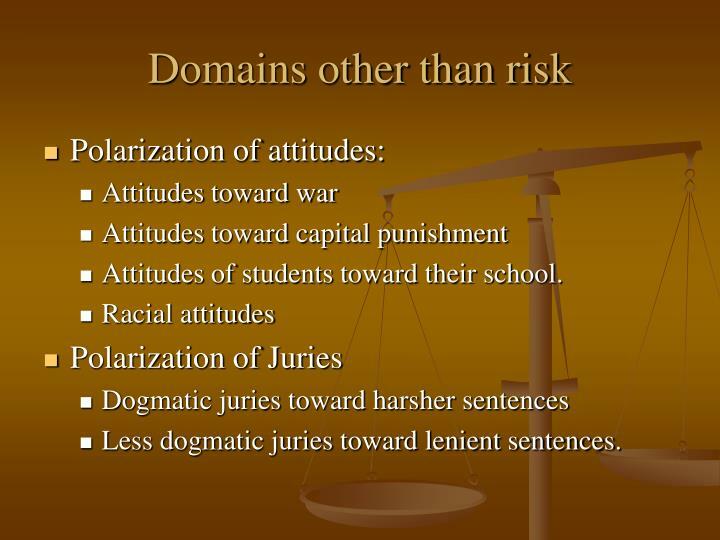 People polarize when they hear persuasive arguments. 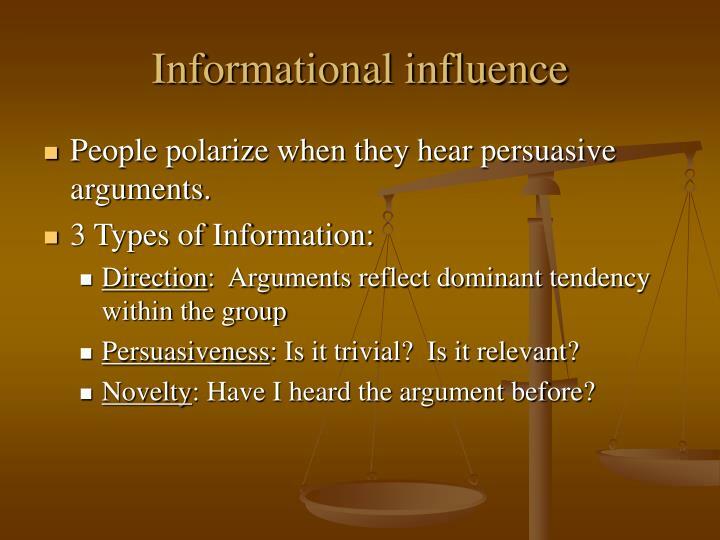 Persuasiveness: Is it trivial? Is it relevant? Novelty: Have I heard the argument before? Which mechanism (s) did you find the most convincing? Do you think there any mechanisms that were not mentioned? (E.g. 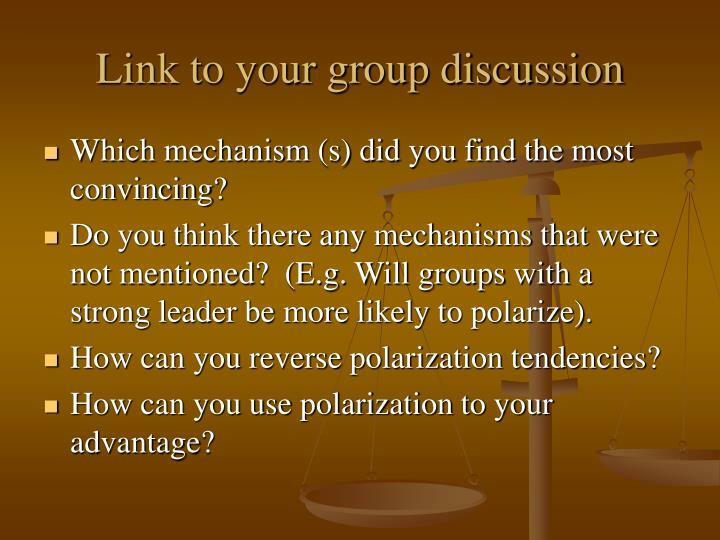 Will groups with a strong leader be more likely to polarize). 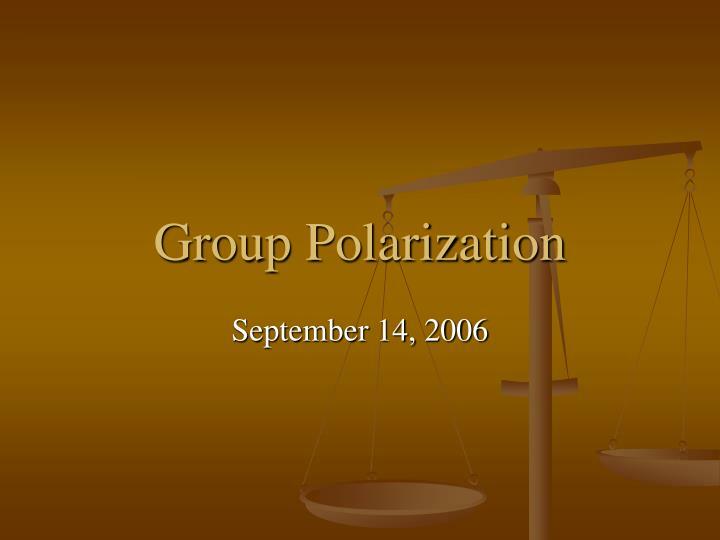 How can you reverse polarization tendencies? 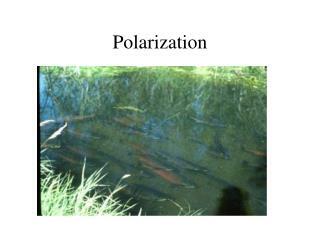 How can you use polarization to your advantage? 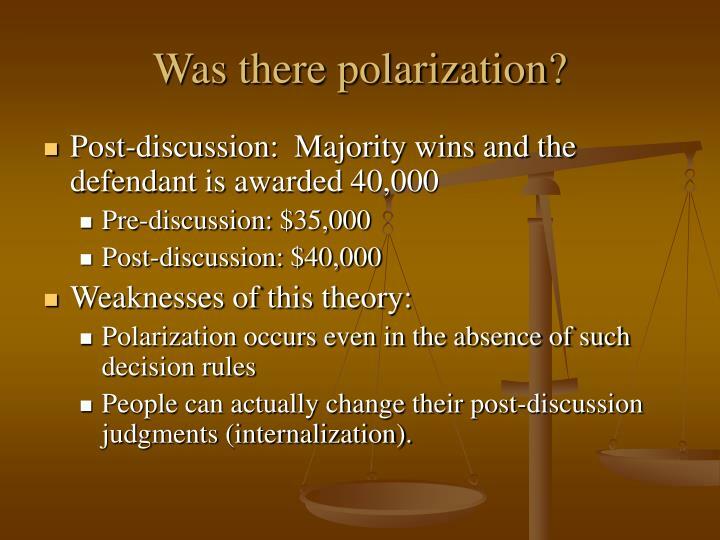 Why is it useful to know about polarization tendencies? 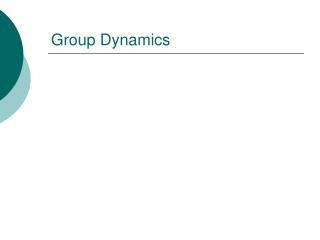 How should we compose groups given this information? 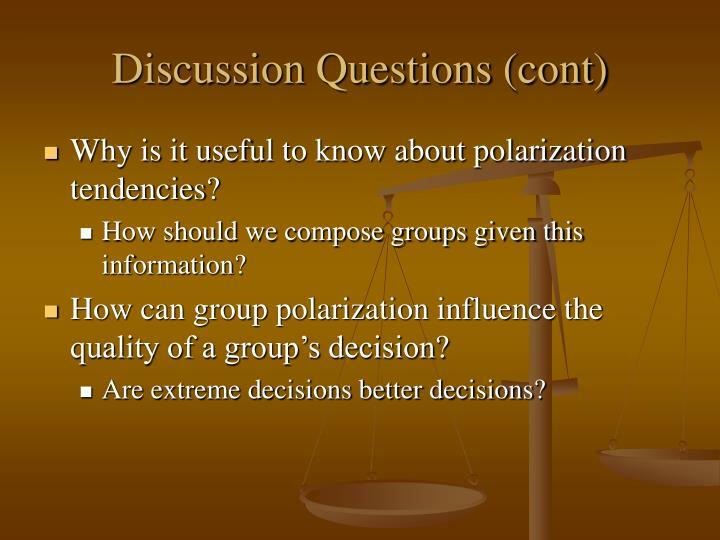 How can group polarization influence the quality of a group’s decision? Are extreme decisions better decisions? 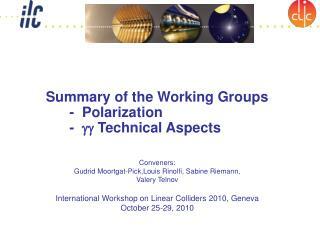 Summary of the Working Groups - Polarization - gg Technical Aspects -. conveners: gudrid moortgat-pick,louis rinolfi, sabine riemann, valery telnov international workshop on linear colliders 2010, geneva october 25-29, 2010. 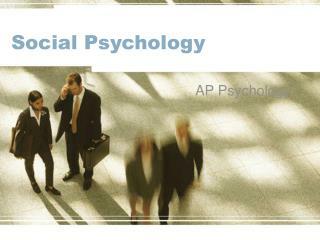 Step Up To: Psychology Social PSI -. 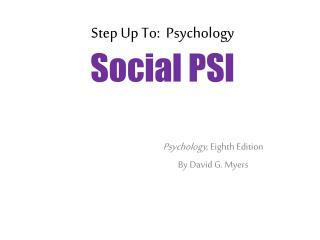 psychology , eighth edition by david g. myers. 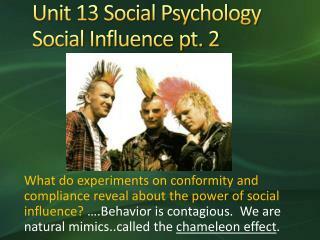 chapter 18: social psychology. conform. you’ve got an attitude. it’s just natural. social thinking. modules. do the right thing. 56. 55. 57. 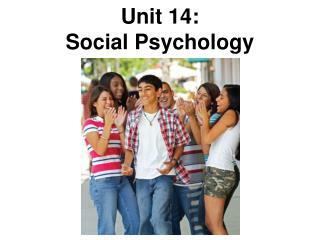 Unit 14: Social Psychology -. unit overview. 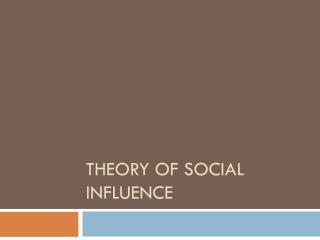 social thinking social influence social relations. click on the any of the above hyperlinks to go to that section in the presentation. introduction. 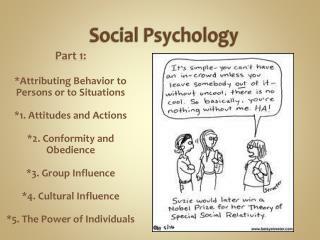 social psychology. section 1 - social thinking. 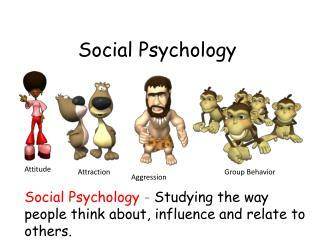 Social Psychology -. 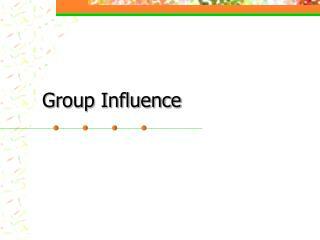 part 1: *attributing behavior to persons or to situations *1. attitudes and actions *2. conformity and obedience *3. group influence *4. cultural influence *5. the power of individuals. 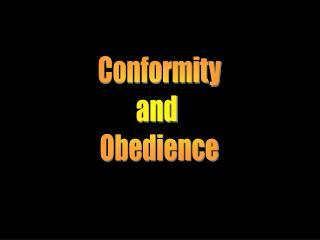 Conformity and Obedience -Conformity and obedience. conformity. 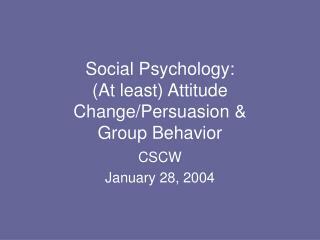 a change in behavior or belief as a result of real or imagined social norms. 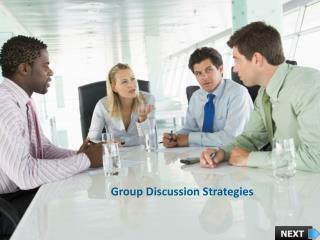 refers to both acting as if you accept the group, and actually accepting the group attitudes. .
GROUP PERFORMANCE -. 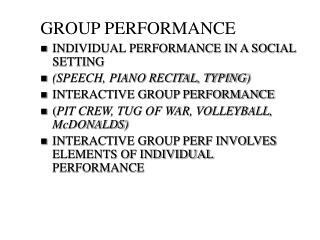 individual performance in a social setting (speech, piano recital, typing) interactive group performance ( pit crew, tug of war, volleyball, mcdonalds) interactive group perf involves elements of individual performance.